Thousands of people were forced from their homes Thursday as emergency crews battled the aftermath of more than 60 fires and at least three gas explosions across the Merrimack Valley. Officials have warned it will be a slow return to normalcy in Lawrence, Andover, and North Andover after the disaster, which claimed the life of an 18-year-old man in Lawrence Thursday afternoon. On social media, local aid groups have been posting information on how residents can help those in need right now. This list will be updated. The American Red Cross Massachusetts said on Twitter that anyone interested in volunteering to help those in the Merrimack Valley can sign up at http://redcross.org/volunteer. “Many homes have been destroyed and people are under an evacuation notice; this could turn into a long-term response. We have workers and supplies on site now, but will need more as we go,” the Red Cross said on Twitter. 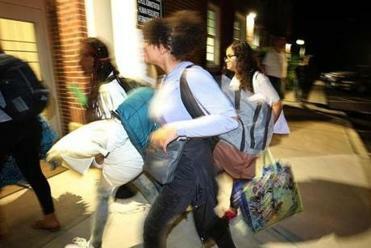 After a string of fires and explosions forced residents from their homes Thursday afternoon, hotels in the Greater Boston Area have opened their doors free of charge. Donations to help Red Cross relief efforts can be made by contacting 1-800-RED-CROSS or http://redcross.org/donate. The Salvation Army of Massachusetts is accepting donations through its website. Four evacuation centers have been set up for those in Lawrence, Andover, and North Andover who have been displaced by the disaster, the Red Cross said. On Twitter, Lawrence police said additional shelters are located at St. Mary’s Church at the corner of Hampshire and Haverhill streets, and at Central Catholic High School at 300 Hampshire St. The city’s senior center is the staging area for receiving donations and accepting volunteers at 155 Haverhill St., the city said in a statement posted on Twitter. The city is asking for donations of nonperishable food, including granola bars, small juice boxes, animal crackers, food for infants, nuts and trail mixes, apple sauce, and pudding. Officials are also collecting toiletries and other items, including baby formula, diapers, new underwear, blankets, pillows, shampoo, soap, and feminine products, the city said. The city is asking that clothing donations to residents be sent to Debbie’s Treasure Chest. The charitable group said on Facebook that it is collecting clothing donations Friday at 15 Union St., Door B, in Lawrence and is seeking volunteers. Donations will be accepted until 4 p.m. Friday, and on Saturday from 10 a.m. to 2 p.m. The group can be contacted at 978-360-4007 or by leaving a comment on its Facebook page. The Essex County Community Foundation is seeking donations to the Lawrence Emergency Fund, which the group said provides assistance during emergency events such as fires, natural disasters, or hazardous events, according to its website. “Funding is provided to appropriate agencies or churches that directly support the individuals and families impacted by these emergencies,” the group said. To make a donation to the Lawrence Emergency Fund, visit www.eccf.org/lawrenceemergencyfund , the group said on its website. For more information, contact the Essex County Community Foundation at 978-777-8876. Violence In Boston Inc. will be collecting donations of water, food, and toiletries starting at 1 p.m. across from the Franklin Park Zoo entrance, the group said on Facebook. The group is seeking donations of nonperishable/microwaveable food, water bottles, blankets, deodorant, toothpaste, toothbrushes, lotion, clothing, diapers, baby formula, air mattresses, and pads and tampons, it said. MSPCA-Angell’s Nevins Farm in Methuen is taking in pets displaced by the gas fires in Merrimack Valley, the group said in a series of Twitter posts. The farm is located at 400 Broadway. Anyone who needs emergency shelter for their animal can call Nevins Farm directly at 978-687-7453 ext. 6101 until 5 p.m. Friday, the group said. After that, pet owners who need an emergency shelter for their animal can call the organization’s medical center at 617-522-7282. Around 9 a.m. Friday, MSPCA-Angell said Nevins Farm had sheltered 19 dogs and nine cats since the fires began Thursday afternoon, the group wrote on Twitter. Animals injured in the disaster should be taken directly to the organization’s medical centers at either 350 South Huntington Ave. in Jamaica Plain or 293 Second Ave. in Waltham, the group said. They also requested donations Friday morning, including for microchip scanners, paper towels, dry cat food, canned cat food, canned dog food, and cat litter, the group said on Twitter. Donations can be dropped off at Nevins Farm, MSPCA-Angell said. John Hilliard can be reached at john.hilliard@globe.com. Steve Annear can be reached at steve.annear@globe.com. Follow him on Twitter @steveannear.